It is almost phenomenal how many people from the west coast of the US have relatives that lived or came through Manning and had their photos taken at the Lyden Studio. Below is Jurgen & Agneta (Thede) Wunderlich. Jurgen Wunderlich, who was born 10/4/1827 in Schwienhusen, Germany and died on 11/7/1897 in Manning. With him is his third wife, Agneta Thede, who was born 1/17/1834 in Erfde, Germany and who died on 3/9/1908 in Manning. 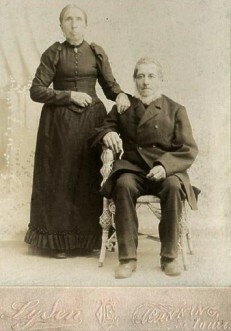 They were married about 1865 in Germany. Jon Ahrendsen (formerly of Manning) and Howard Erbst's wife of California are both descendants of Jurgen Wunderlich. #1 - was a Dose or Doose----not sure if that is a first name or surname. She only had one child, Jurgen Jr. This is Howard's wife ancestor, to my understanding. #2 - was Johanna Katie Peters---she had Henry, who died as a baby, Dorothea (my great grandmother), Katherina, Anna, and John (who married a Flora Gardner, who I was told was from Manning also). #3 - was Angneta, the one in the photo. She had Margaretha (who married Heinrich Ahrendsen (I am assuming Jon Ahrendsen's ancestor) and Thede, who married a Mathilda Hansen. All of these children were born in Germany, and all immigrated to America. Katherina eventually settled in Nebraska and Anna, I am not sure of. John settled in South Dakota, I believe. We think that John is the great grandfather of Tom Brokaw, the TV news commentator. John had a daughter, Jennie, who married a Brokaw, they had 7 children and we think one of the sons is the father to Tom. But we do not have any confirmation on that. Jennie was my grandmother Struve's attendent for her wedding.